A septet of abstract electronic and electroacoustic incantations both visceral and evokative that resonate in time, space and the imagination. For the last twenty or so years I do come, very occasionally, across the name of Michael Chocholak. In the old days part of the cassette network that I was also part off, but somehow I don’t think I ever heard any of his work very well. Maybe here and there on the odd compilation, but never something that made a lasting impression. I also know that he recorded some work with Conrad Schnitzler, and upon hearing ‘Hollow Bodies’, which is so to speak my first introduction to his work, I can see why Chocholak worked with him. Chocholak has seven pieces of music on this CDR, varying in length between seven and half minute up to fifteen and half minute. The music of Chocholak belongs to the same ‘non-keyboard’ cosmic music as Schnitzler. By fiddling around with all the knobs a synthesizer has, linking various machines together, adding sound effects, a dark and alien world is created. The world of dark space, late at night empty industrial spaces, dark alley, b-movie, film noir. Sometimes all these can be found inside one track, but sometimes the music is somewhat more sparsely orchestrated, especially when he uses electro-acoustic sources which are feeding through his bunch of synthesizers, such as in ‘Sine Language’. However minimal is not a term that applies to this kind of music. Everything is loaded with sound, from top to bottom, constantly shifting back and forwards, up and downwards. Like said, cosmic music from the seventies sounded much alike, but Chocholak is pretty dark and not light hearted. Though music-wise not a big surprise, this is however a very enjoyable release and are most welcome, belated introduction. 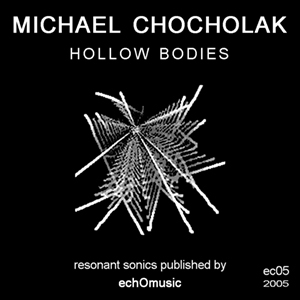 There are pretentious people all over the experimental music world, but Michael Chocholak doesn’t sound like one of them. Especially when listened at low volume in the early hours of the morning – and I strongly recommend to do it via speakers – “Hollow bodies” gives the idea of a pretty innocent try at guessing what lies behind the secrets of an audio cosmos which seems somehow reachable yet remains mostly undetermined. Synthetic shapes and hermetic encumbrances are all part of a game in which every pawn is entirely active, sometimes to the point of self-emphasizing their role almost in excess; matter-of-factly, the only defect perceived here is a slight overstaying of a few repetitive formulas, but luckily this doesn’t happen so frequently and the “plus” sides are vastly superior. What I really like instead is the way some of the electronic waves work amidst silences and slightly disturbed celestial moistures, organisms of effusive promiscuity glimmering in eccentricity. Some of the parallel courses depicted by these impressions are indeed engrossing: those are the very moments in which I think that Chocholak – if given the right opportunity and by removing some dead branch – is capable of giving us something even better than this artifact, itself already walking on steady legs. This release from 2005 offers 72 minutes of abstract electronic music. How can something be atonal if it possesses harmonic resonance? Well, Chocholak tackles that dichotomy with the music on this album, creating stark soundscapes that utilize abstract electronics which exhibit a hint of harmonic presence. Squealing cybernetic elements and synthetic beats of an erratic nature conspire to generate tuneage that is edgy and often disturbing. The pieces exude a striking alien quality with definite passion but little humanity. Machines rule here, exploring realms that have never experienced organic occupancy. Gritty drones establish a foreboding perimeter, while effects and electronic outbursts cavort and seethe and duel with each other for supremacy of these harsh environs. Unrhythmic beats rise and recede. Metallic strings are tormented and goaded to produce buzzing vibrations. Piercing tones sound off with unpredictable frequency. And yet, there’s a strange cohesion to this apparent chaos, as random expressions combine to approximate a trace of harmonic flow. What initially seems to be musique concrete gradually adopts a semblance of droning resonance. This CDR comes in a metal case with sparse information. Δυνάμεις του σκότους επικαλείται ο ερεβώδης Michael Chocholak ίνα τον συνδράμουν στην ανίχνευση της κρυφής αρμονίας των “Hollow Bodies”. Άδηλες παρηχήσεις δεσπόζουν στις αποδομητικές του τελετές. John Cage and friends would be proud. It’s sort of classic in a way. Vareseian? The Zen of tones and sonic space. Very nice looking cd package. The best thing I’ve heard in a long time! Wow, really evocative and sensitively done. Beautiful. My hat is off to you. This is one I will play many times.